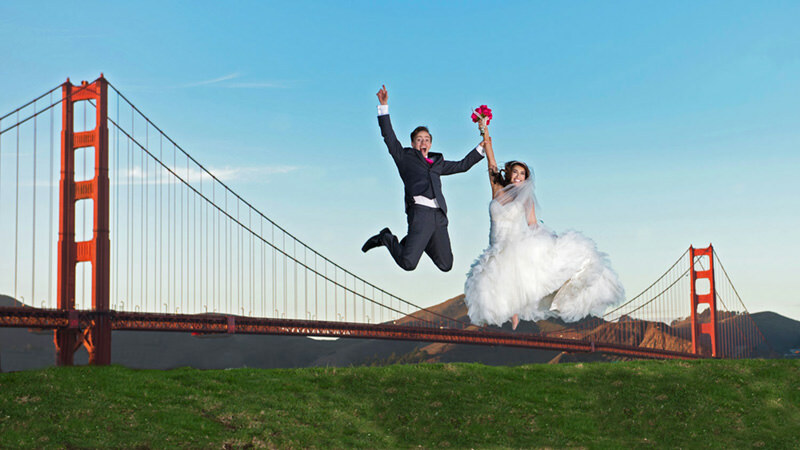 The couple below appear to be jumping over the Golden Gate Bridge as they complete their San Francisco photography tour at Crissy Field. 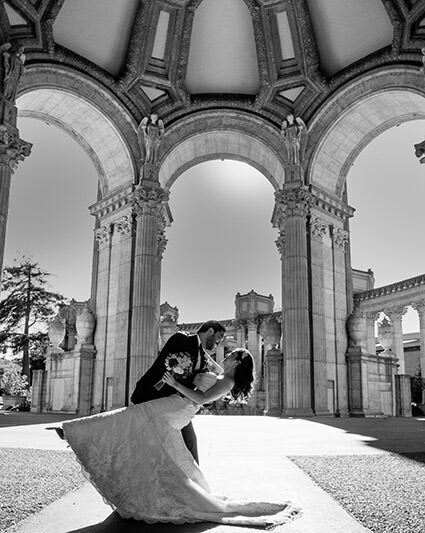 We have a number of great locations in San Francisco area to take our wedding couples after their City Hall wedding is complete. Crissy Field is definitely one of our favorites, but let us know yours! 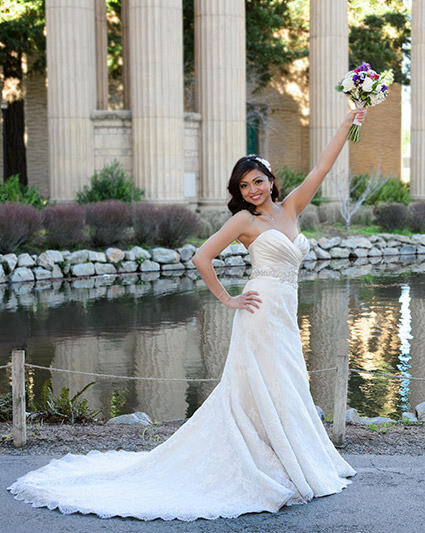 Our “San Francisco” wedding photography package 4 hours of coverage and an exciting tour of SF. The photo below is an example of the types of photos we like to shoot when we take our couple out on the town! We will visit the Golden Gate Bridge, Palace of Fine Arts, The Legion of Honor, Russian Hill, Coit Tower or the Japanese Tea Gardens to name just a few. We even supply your transportation and can suggest some of our favorite spots if you aren’t sure! We loved Phoebe’s wedding dress and decided it would look great to have her run through the halls of the Legion of Honor (below). We always try to provide each of our bridal celebrants with their own unique images. Obviously, we receive lots of requests for many of the classic poses and locations that are seen on our web page, but it’s also important to make every bride and groom’s wedding pictures special. We are also quick to ask our clients if they have any preferences for locations and poses at San Francisco city hall or anywhere else. 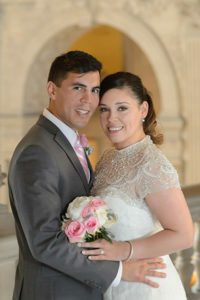 Michelle and David booked our “City Hall” wedding photography package which provides 1 hour of coverage and includes interior and exterior photos of the building. We also provided them full coverage of the ceremony. 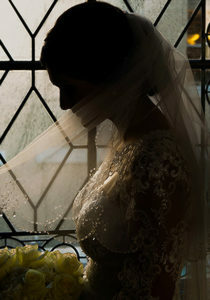 I love the natural light present for this window shot of Michelle. All of our clients receive a combination of color, black & white, and sepia tone images as you can see on this page. For the photo on the left, we used a radio slaved remote flash unit and placed it behind the subject to light up the veil and add drama to the shot. 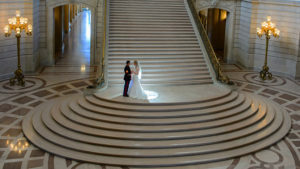 The grand staircase is a beautiful wedding photography location in the late afternoon especially if there aren’t too many people milling around. To add to the drama of this shot, we back-lit Laura and Robert with a speed light. Notice the natural golden highlights on the stairs themselves. 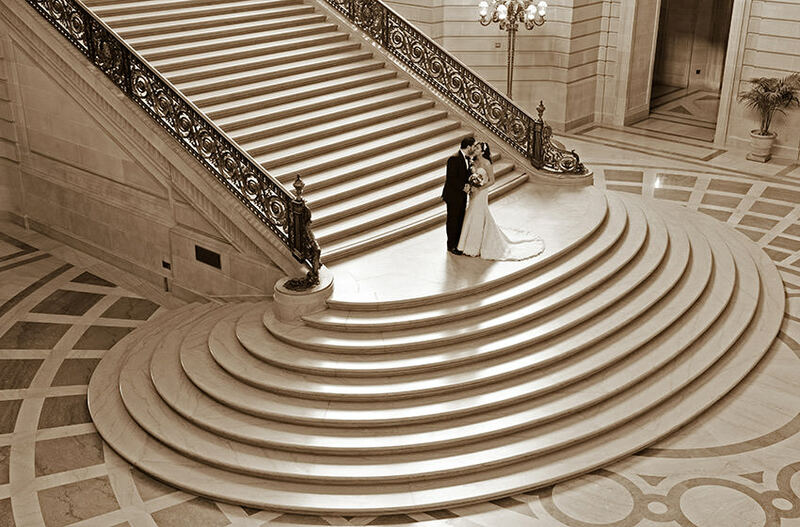 The staircase at City Hall is probably one of the top indoor locations for wedding photography in San Francisco. 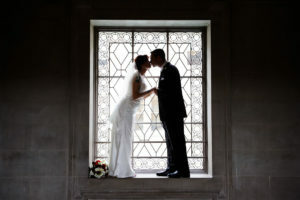 The same couple is pictured below with Laura in front of city hall’s 3rd floor window illuminated by beautiful natural light. We also used an umbrella flash to fill in some of the shadows. 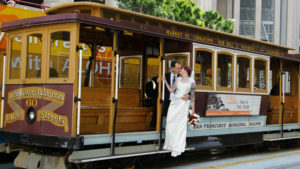 April and Michael booked our “San Francisco” package with optional wedding reception coverage. They hired a private wedding celebrant and had their ceremony on the beautiful 4th floor balcony. After some shots around the building it was on to the Palace of Fine Arts to take some of the photos you see below. We ended our day at their downtown San Francisco wedding reception location. Ken and Pat loved the architecture of this great venue and we made sure to capture it for them. 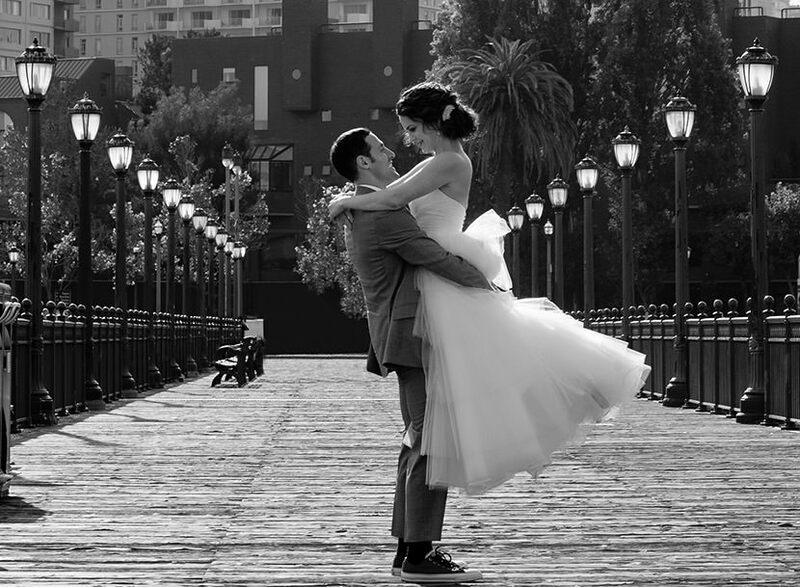 We often ask our couples to tell us the types of photos they would like at City Hall. 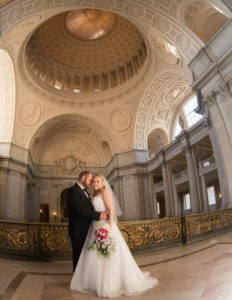 To be a successful San Francisco City Hall wedding photographer, it’s important to listen to your clients and incorporate their preferences. Love the rainbow socks! 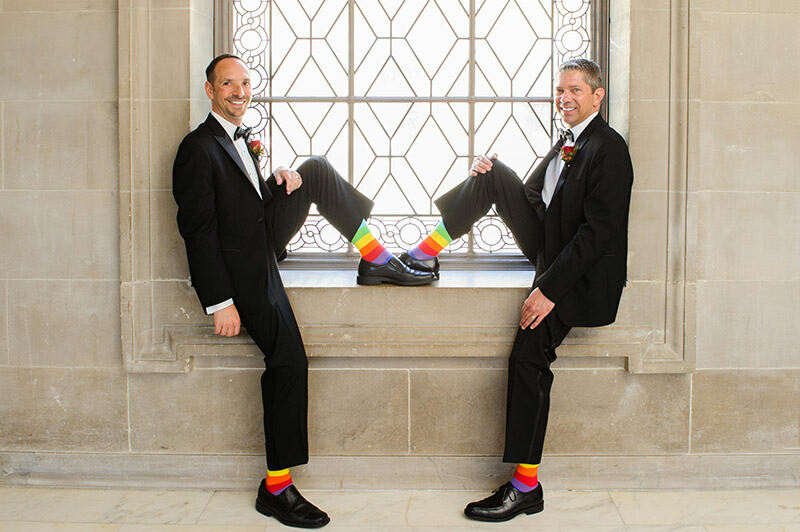 Author tonibaileyPosted on March 1, 2018 March 4, 2018 Categories WeddingsLeave a comment on Rainbow Socks! Vanessa and Matthew decided to rent out the 4th floor balcony so they could have a private ceremony with their friends and relatives. It was a beautiful wedding in the perfect location. After the ceremony, we took the 2 of them on a private photo tour of the building! Sometimes the best images are created by just leaving the couple alone for a while to interact (as seen in the shot on the right below). It was so much fun photographing Robyn and Jeff’s marriage. 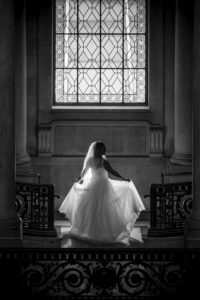 They had a beautiful civil ceremony surrounded by family and friends and then we toured around the building to capture romantic shots. Then it was on to California Street where we took a whole series of iconic Cable Car photos. It’s hard to imagine a more fantastic setting to top off their wedding day. Thanks to Robyn and Jeff for one of our best times in San Francisco. The photograph below was one of our favorites. We even got a thrill ride through San Francisco in their Friend’s Tesla! Author tonibaileyPosted on January 2, 2018 January 16, 2018 Categories WeddingsLeave a comment on Cable Car Fun! 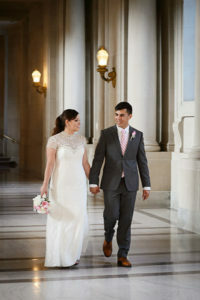 Nadya and Leo were a romantic couple and booked us for our popular yet affordable San Francisco City Hall wedding photography tour package. The photo above left was taken with a Fish-Eye lens and actually shows the dome of City Hall which is straight above. The upper right photo was taken clear across the building by using a radio slaved flash behind the bride to provide this dramatic look. Toni created the beautiful pose and Nadya did the rest! 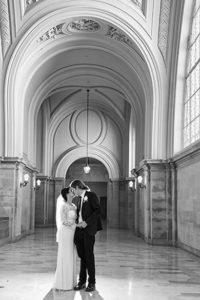 Sara and Pete took advantage of our extended City Hall photo coverage package and booked us for a full day wedding shoot. We started at San Francisco City Hall and ended up on a Horn Blower yacht, cruising around the SF Bay. Pictured here at Pier 7 before boarding the party boat, Sara and Pete were a fun couple and were up for anything we suggested. When photographing weddings in the San Francisco downtown area you often have to be patient and wait for the right moment when less people are present in the background. Photoshop is sometimes needed at this very popular area.